Ven. Lama Kunga Rinpoche will bestow the empowerment of Black Manjushri at Ewam Choden on Sunday, June 15, 2014, at 1:00 p.m. Manjushri is the Bodhisattva of transcendental wisdom. 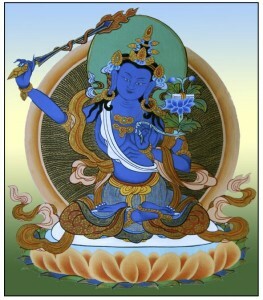 In general, the practice of Manjushri cuts ignorance and delusion, and opens the mind of wisdom. Additionally, the Black Manjushri, a more wrathful form, is a powerful force against serious illnesses, obstacles, fears, obscurations, negative forces, and protects traveling. The requested donation is $30. and dana (personal offering) to the Lama and monastics is separate.